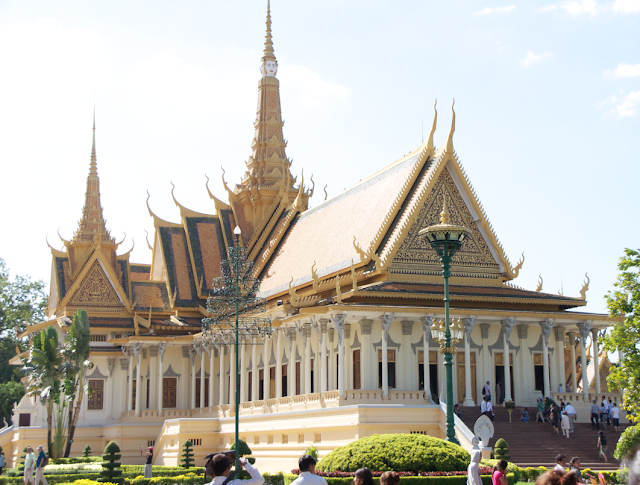 Cambodia - Phnom Penh ~ Learn, Live, and Explore! Most world travelers choosing to visit Cambodia set their sights on Angkor Wat, and the surrounding areas of Siem Reap. 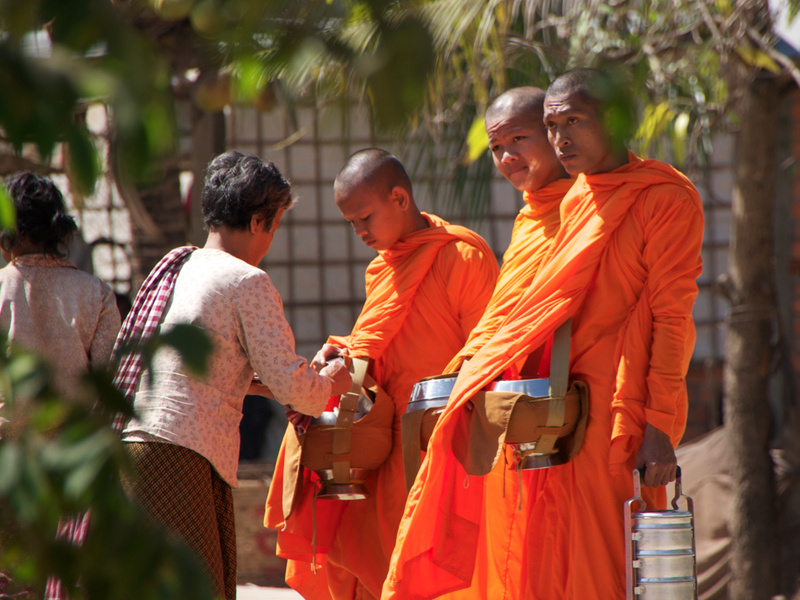 To appreciate Cambodian city life, however, heading to the country's capital and largest city, Phnom Penh (said puh-nom pen), is a great alternative. I am fortunate to have a friend currently living in Phnom Penh, so not only did I have someplace to stay but a fantastic tour guide! The city is your typical big Southeast Asian city, with its congested roads full of motos weaving in and out of cars and random placement of businesses amongst residences. There are also large central markets to find goods and handicrafts that you never realized you wanted until they were in front of your face, to practice your tough bargaining skills, and to get some delicious meals for around $1. 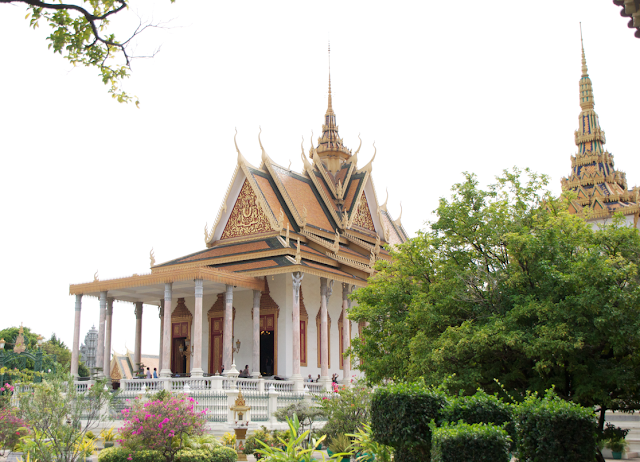 We found ourselves wandering the maze of vendors at the Russian Market, but there is also Phnom Penh's popular art deco historic Central Market and the Night Market that both target tourists more than locals. 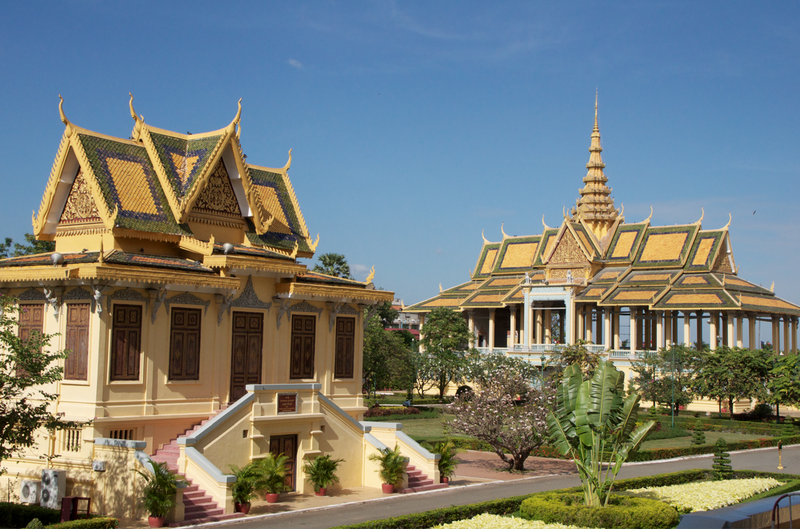 The Royal Palace and Silver Pagoda - To see beautiful Cambodian architecture and manicured gardens, you should not pass up going to the Royal Palace. The Silver Pagoda, one notable building on the Palace grounds, is named for its silver tiled floor. Note that the grounds are closed mid-day, so if you miss the morning session, grab a long lunch because the gate does not reopen until 2pm. 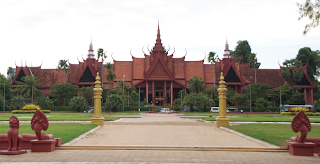 The National Museum - Located next to the grounds for the Royal Palace, this museum showcases Angkorian artifacts and post-Ankorian Buddha sculptures. Unfortunately, we did not squeeze this into the tour this time. Wat Phnom - A small temple on a hill near the U.S. Embassy, legend says that this is the spot where Phnom Penh was founded. Translated, Phnom Penh means hill of the creator, Lady Penh the nun, who built this hill to house the four Buddha faces she discovered inside of a tree she had fished out of the river. 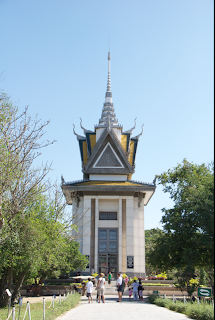 Choeung Ek Memorial (Killing Fields) - Just outside the city is a memorial on the grounds of one of many mass graves created by the Khmer Rouge regime during the late 1970s. Led by Pol Pot, the Khmer Rouge sought to eliminate from the population anyone with the ability to engage in "free market activities" including: people with educations (intellectuals), wealth, connections the former government or to other countries, residents of urban neighborhoods, minorities, non-Cambodian nationals, and suspected traitors in order to create an isolated, repressed, agrarian country and minimize the risk of an uprising. Over the period of 1975-1979, the Khmer Rouge successfully orchestrated the mass genocide of as many as 1.7 million people. 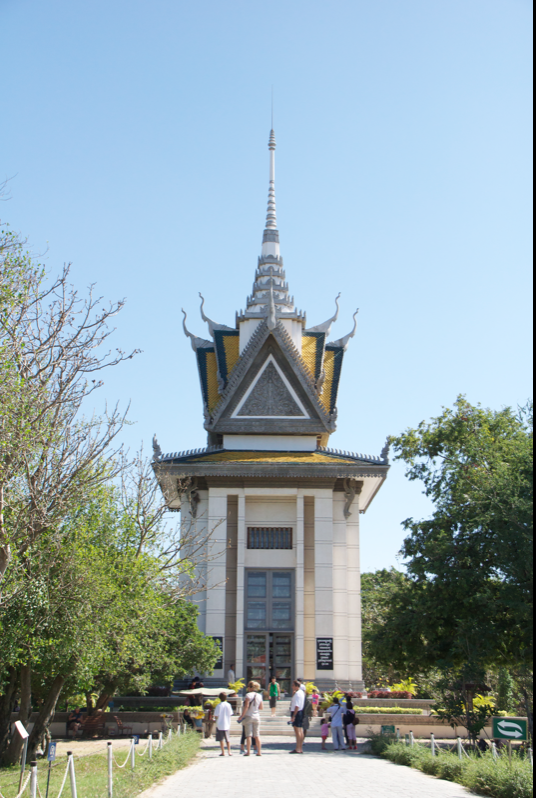 There are many killing fields scattered around the country, and the one 15km outside of Phnom Penh is the site where up to 20,000 executions of men, women, and children took place. Many of these victims had been transported from the S-21 Prison, where they were interrogated and tortured. The audio tour leads you through the grounds, describing the activities that took place at each stop, including the very disturbing Killing Tree. 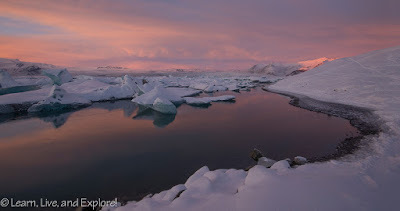 While most of the remains have been exhumed, during rainy season, it is said that bones, clothes, teeth, and other items may be churned up from the soil of the mass graves, so visitors are warned to be on the lookout for these items. 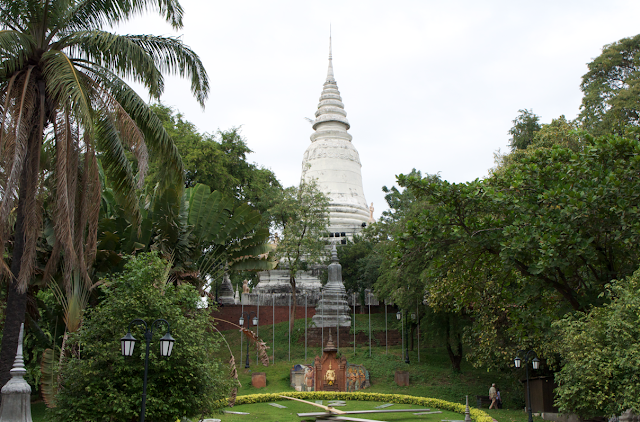 The memorial stupa, seen when you enter the gate, contains 5,000 skulls of the victims. There are several activities to do in Phnom Penh outside of the tourist sites. 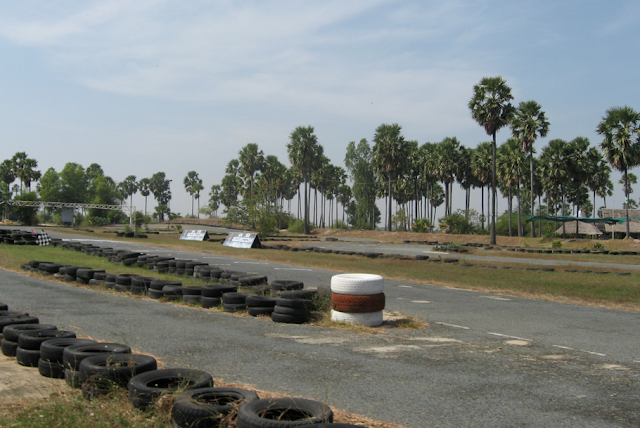 For the adventurous spirit, head to the Kambol F1 Go-Kart track located in Kambol Village past the Phnom Penh airport. This outdoor track is very long, has a lot of tight turns, and has a great hill right before the long, full-throttle straight away. If you want to try something different, there are several shooting ranges available to the public, some on Cambodian Army brigade bases. 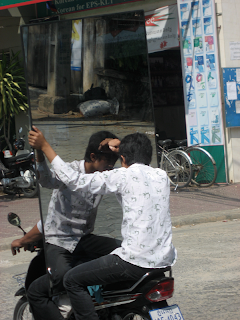 There's actually one located near the go-kart track, but the tuk tuk drivers very likely know where to take you. At the range, you are given a binder, a "menu," of all the available weapons, ranging from an AK-47 to a RPG. This excursion is not cheap. One magazine of 25 bullets for the AK-47 was $40, and the RPG (which I, of course jokingly, selected as my first option) was $350 for one round. Based on our lack of experience, we ended up shooting the AK-47 at a target and some coconuts (to make them "dance"). To get outside the city and see village life, find a bike tour. 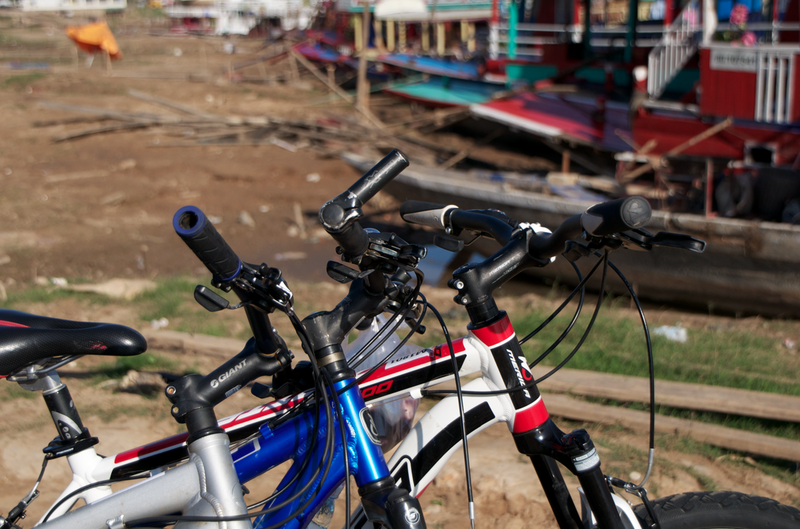 We chose Grasshopper Adventures, located at The Vicious Cycle bike shop, for their half-day, 25 km Islands of the Mekong bike tour. Taking a ferry across the Mekong River, after a short ride from the shop along the busy waterfront street, we started our journey down dusty village roads towards Silk Island. All along the way, little kids would pop out of their houses and say "hello! hello! hello!" 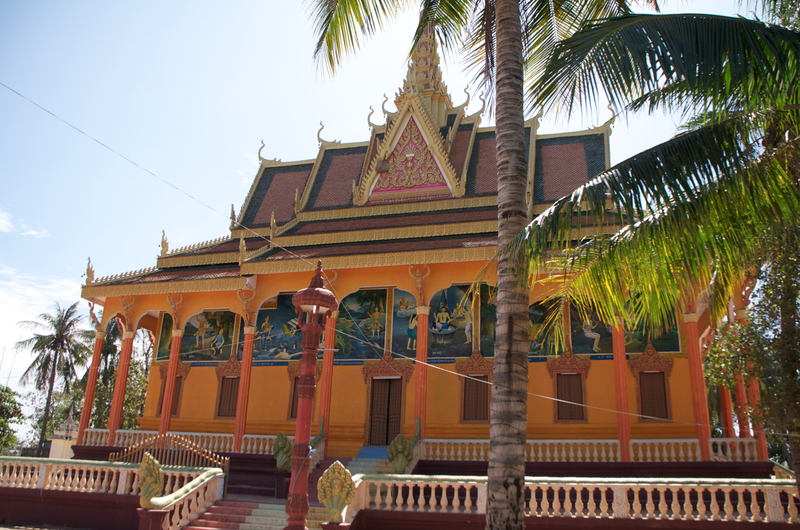 Our first stop was at a Chinese temple with a view of the outskirts of downtown Phnom Penh. Next, we continued down the roads toward our second ferry landing, where we snacked on a sticky rice banana, steamed in a banana leaf. 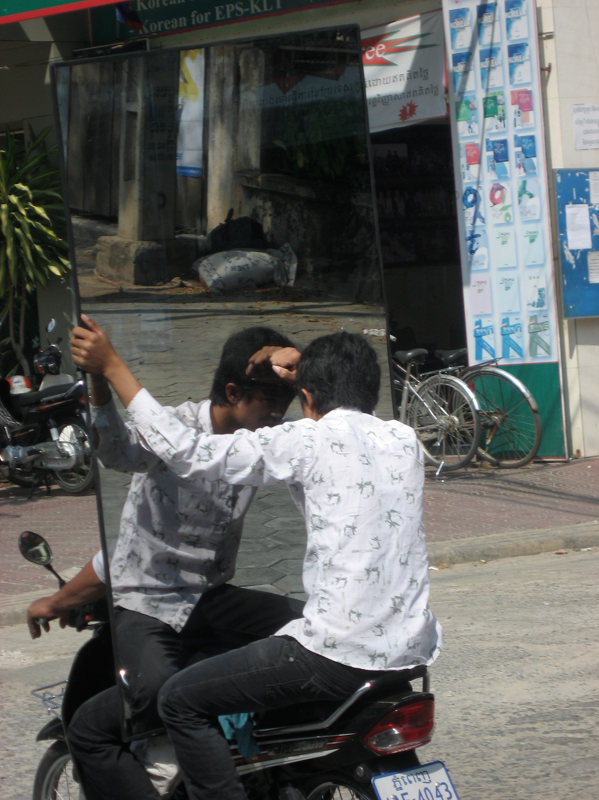 The ferry rides are quite the experience because you never know what you are going to see miraculously balanced on the back of a tiny moped! Definitely a different way of life! 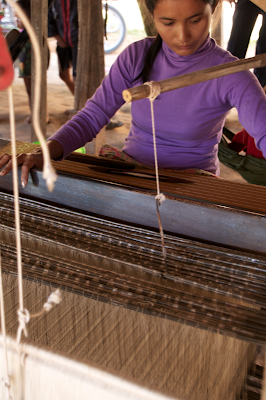 On Silk Island, we stopped to watch locals work their looms, creating brightly colored, patterned silk fabrics. They are happy to lead you through the entire silk weaving process, from cultivating silk worms, spinning the thread, to working the intricate loom. Of course, they are equally happy to take you to the table of goods for sale. Take care to notice that many of the available fabrics are machine made, not handmade, which is differentiated by the edging. Don't pay too much for the non-handmade goods, and make sure to drive a good bargain. 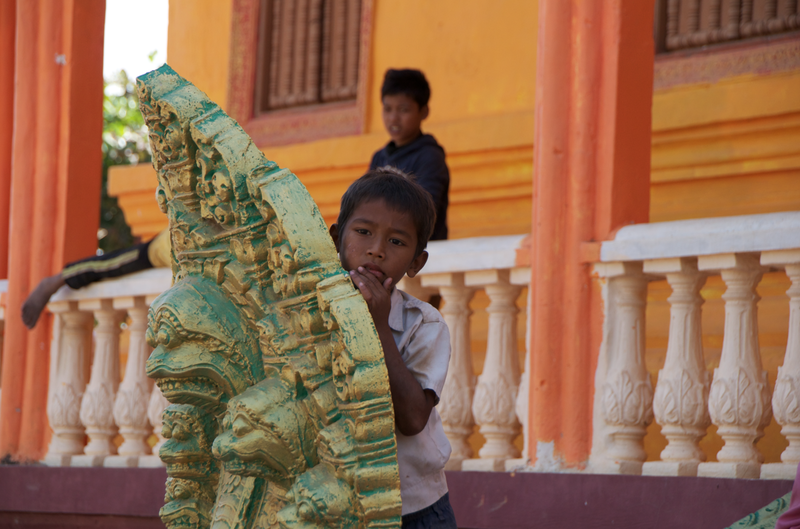 The prices they charge are high for Cambodian living standards. 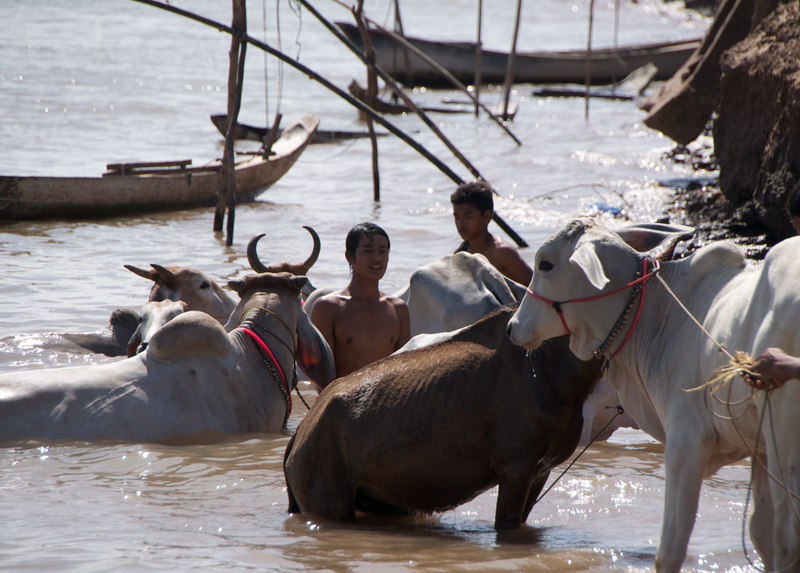 At our third ferry landing, on our way to visit the second island of the tour, we got to watch the locals as they gave their cows a refreshing bath in the river - cow spa! On the second island, we continued to pass local silk weavers and stopped to learn more about a prominent Buddhist temple. Exhausted, despite the flat roads, we took our last ferry back into Phnom Penh and finished the adventure with a big Cambodian lunch at The Vicious Cycle. Eating in Phnom Penh was great. Due to the relatively large population of ex-pats living in the city to work at various embassies, there are many restaurants that offer non-local cuisine at very reasonable prices. But the best part of the city had to be the spas - a 60 minute foot massage for less than $10...."phnom"inal!!!! U.S. citizens can apply for a visa electronically in advance of arrival in Cambodia. Click here for the official e-visa site.